It often takes a crisis of major proportions for positive change to occur. The recent experience of Latvia clearly fits the bill. The credit-fuelled economic boom from 2005 to 2007 in Latvia has been compared to an athlete getting impressive results while being on steroids. After the bust that followed the subprime lending crisis in the US and the global liquidity crunch in 2008, the Latvian government had to ask for help from the IMF and the European Commission to keep the country solvent. The situation looked extremely bleak, with the volume of economic output declining by more than 20% from 2007 to 2009, real estate prices dropping by two thirds, the budget deficit reaching 10% of GDP in 2009 and unemployment at the bottom of the economic cycle exceeding 20% of the working population. However, five years later Latvia has staged an impressive comeback. While initially being export-driven, growth spilled over to domestic demand, with this year household consumption becoming the main engine of growth. The economy has been growing strongly for the last three years, and the seasonally adjusted quarterly GDP in the middle of 2013 was already 18% above the lowest point of the financial crisis. Unemployment, although still high, has come down sharply and is already lower than the EU average. The extraordinary elections to the parliament in 2011 have also resulted in considerably reduced influence of certain business groups on the decisions made by the parliament and the government, which has clearly improved the investment climate. The loan from the IMF has been fully repaid ahead of schedule and the government budget as well as the current account are close to being balanced, indicating that both the public sector and the country as a whole have returned to living within their means. The state treasury has successfully returned to international capital markets with several Eurobond emissions that have seen investor demand considerably exceed the borrowing needs of the government. Latvia has also fulfilled the Maastricht criteria and will get the euro in 2014, thereby fully eliminating currency risk for investors from other euro zone countries. In addition to returning to macroeconomic stability, a number of structural reforms have been carried out. The number of state agencies has been halved and the number of public sector employees reduced. A new insolvency law has considerably simplified insolvency proceedings and improved the legal protection process. An arbitration court reform is underway, with the aim to radically reduce the number of arbitration courts and improve their quality. The tax wedge on labour is gradually being lowered by the personal income tax, which was cut from 25% to 24% starting in 2013, and a decrease in social security contributions by 1%% that are in effect starting in 2014. Measures to limit the impact of the subsidies to the renewable energy sector on the price of electricity paid by the businesses have been approved by the government. A new law on construction, which will considerably streamline the construction process, has been passed by the parliament and will enter into force in 2014. The first pilot projects have been started that aim at moving towards a dual vocational training system based on the German model. Taken together, these steps significantly increase the attractiveness of Latvia as a place for investment and doing business. Challenges remain, a key one being the decline in population as a result of both emigration and a negative natural growth rate. As a result of it, the location of business has become increasingly important. During last decade Riga and the greater Riga area, as well as key regional centers such as Jelgava, Valmiera and Ventspils have grown in relative importance, while small towns that are located far away from the capital are losing critical mass and struggling both to retain qualified employees and maintain an adequate business infrastructure. Other aspects of the business environment that need further improvement are the low efficiency of the court system, the relatively poor state of the roads and the undeveloped alternative capital market. However, the improvements achieved during last years have been truly remarkable and have already been recognized by institutions, including the World Economic Forum. 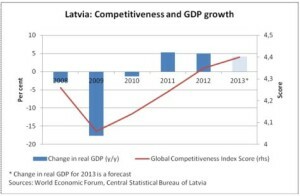 In the comprehensive Global Competitiveness Index administered by it, Latvia has seen its global rank go up from 68th in 2009 to 52nd in 2013. David Brin: Why Do We Need to Forecast the Future? David Brin is an American scientist and author of science fiction; he has received Hugo, Locus, John W. Campbell Memorial, and Nebula Awards. He has shared his insights with corporations such as Google, Procter & Gamble, and SAP, with NASA, and even the United States Department of Defense. According to D. Brin, he usually asks questions and does not give answers to his clients, since the skill to ask relevant questions is of paramount importance. VALSTYBĖ: You have consulted a few of the world’s largest corporations. What can be predicted considering the future by a writer, that can’t be predicted by corporate executives earning tens of millions of dollars? All human civilizations invested heavily in prediction of the future. In the past, to forecast the future, shamans read goat entrails or watched the distribution of the stars. This process has changed today, yet shamans have survived under different names, from stock market analysts to politicians and business leaders, whose job is to appraise possible scenarios of the future as accurately as possible in order to employ available opportunities and resources accordingly. Besides being a writer, I have been trained as a scientist, and I tend to distrust those professions since their predictions, as often as not, are based on intuition, not science. But, as is known, even science can be murky as it looks ahead, while intuition sometimes tells a lot more. The answer to the question why my predictions are appreciated by corporate executives earning millions of dollars is rather simple: they seldom dare to peer beyond the five-year horizon. I must make it clear that in such cases not so much possibilities of specific events are predicted, as of the trends, which will have major impact upon the lives of humans and the planet. It is rather negative trends, not positive ones that are normally sought for in the future, so that possible issues and risks are known well in advance. A commonplace example: George Orwell's classic novel “1984” was a "self-preventing prophecy" that stirred millions into action, working to prevent the author's vision from coming true. VALSTYBĖ: What are the most common questions asked by representatives of the largest corporations? What are they trying to learn from you? Do they want to know predictions about the evolution of the technology, or do they want to learn how the new technology might influence people’s lives and lifestyles in the future? In the near term, they always want hints about business opportunities and dangers. For example, what trends might make the current motif for cell-phones obsolete? Will rising world education levels, decentralization of skills (when anyone may do anything), and the rise of desktop manufacturing (for example, 3D printers) mean the return of cottage industry, replacing large-scale manufacturing? Will biological synthesis follow its own Moore's Law pattern, the way computers have, leading to an Internet of organic chemistry? The biggest forces are social. What will happen when the 20th Century's relentless drive to "professionalize everything" comes to an end? Will we see a rising era of amateurs who won’t have a thorough understanding of anything because half of the work will be done by computers? Will ubiquitous cameras - getting smaller, faster, cheaper and more mobile each year - lead to a Big Brother state, to increasing proliferation of pictures on Facebook, or to hyper-empowered individualism? And if all individuals will be able to get a live view of any of the remotest corners in the world? Will this lead to tyranny by mobs, when someone is wrongly accused and he or she is watched by the enraged who seek to do away with him or her? Or maybe the world will just become a safer place to live? Paradoxically, I do not offer answers, only a lot of questions to my clients. It is the skill to ask relevant questions that is essential. VALSTYBĖ: Is it possible to state that the vitality of a corporation directly depends on its ability to identify how the world will change over the next decade? Is knowledge of the future important to individuals? Kings rule. Then comes the time for them to die. We strive to learn how the world will be changing but we’ll never know it for sure. Corporations may corroborate their predictions by collecting and analyzing Big Data, by engaging in activities ranging from social modelling to artificial intelligence, however, no matter how effective these predictions are, sooner or later, they are doomed to fail and corporations to collapse. And there is just one trait that helped corporations and human beings survive for thousands of years. That trait is resilience. It is not enough to have knowledge of the future; one must be resilient to survive. It is only natural that both small and large corporations aspire to know the future. It is capacities and resources made available for the search of the future trends that make a difference. VALSTYBĖ: What do you think about a vision that in the year 2050 nobody will be able to lie, ‘cause a sensor embedded in the clock or in any other part of the “body” will work as a lie detector, and consequently mendacious populists will lose any chance to win elections? My 1980 novel Sundiver dealt glancingly with a future in which it became difficult to lie, because all citizens could track lies and deceptions. Recent scientific work suggests that something like this may be coming. In which case, we will have to decide what kind of society we want when such technologies are around. We have several options. If we try to ban the technologies, that will only ensure that in the end only governments and, for example, secret services will get them. Or we may all grab these methods and then use them against each other, dissolving into a morass of accusations and recriminations. A war of all against all. Statistically, a person tells a lie three times in a 10 minute conversation. The third option is to use such technologies by cultivating a general social norm of forgiveness for small mistakes… because we will all need it. Catching dangerous or malicious lies, we may also forgive and shrug-off the inevitable foolish exaggerations and slips of the tongue that are deeply part of human life. VALSTYBĖ: In your opinion, what changes are there in store for us before, say, the year 2050? People with artificial body parts and cyborgs all around? A world without disease and with immortality? How about a vision, where everyone is living in a virtual world, where androids do all the work in the “real” world? The most spectacular change, awaiting all of us in the future, is the ability to process information. The amount of knowledge accumulated by mankind is enhancing at a breakneck speed; in a few decades, the rate of knowledge accumulation will be hardly conceivable. Just one technology - artificial intelligence - could arrive from any of six different directions making acceleration of knowledge accumulation even faster. Is our brain capable of handling such amounts of information? Some researchers propose that human intelligence will develop alongside the increasing amounts of information in order to be able to process it. But if our brains fail to handle information, we’ll need help – the organic brain will be either supplemented with technical gadgets or linked with external components, such as computers, etc., much as our ancestors did when they added another layer - when mutation and evolution gave them the spectacular prefrontal lobes, and it was their way to survival. VALSTYBĖ: Which of the currently emerging technologies will lead to major changes in how we work, how we consume, and how we produce goods? Desktop fabrication will probably not eliminate manufacturing, mass-production and delivery systems. But it will become a commonplace factor, when people can upload design patterns and create their own small parts or machines and print these using 3D printers or similar technologies. Even factory-produced items will undergo change; they will be personally tailored to the needs of particular customers, being more unique and individual. Impatience with old-fashioned delivery systems may provoke the return of pneumatic tube transport for small or medium-scale packages. If asteroidal resources become available, all metals will plummet in price, including gold and platinum. The late 20th Century obsession with efficiency in production and delivery improved profit margins and quality in many industries, like automobiles. Mere efficiency, however, is not enough, therefore dependence on trans-oceanic shipping will reduce, and local self-sufficiency will be a counter trend of real value. VALSTYBĖ: Let’s go back to the year 2050. What cars will we drive then? Some people say that we’ll have better perfect batteries for electric cars, others say that the future belongs to hydrogen powered electric cars. What is your opinion? Maybe we won't have cars at all? I portray hydrogen powered cars being used by 2050 in my novels EARTH and EXISTENCE. There are real potential advantages… but not in the near term. The required infrastructure, if we copy gasoline distribution, would be insane. Hydrogen will make sense only when solar power becomes so plentiful that you fill your tank at home. The big news has been the spectacular improvement in electric cars. The motors and control systems were more than ready and battery improvements, including super-capacitors, are clearly on the horizon. Many science fiction authors speak of the self-driving car, indeed, Google driverless cars are already running on our streets. Science fiction tales envisioned that it would require "smart roadways" with embedded cables and centralized computer control. But onboard vision and analysis systems have progressed to the point where cars can see us, anticipate trouble and avoid accidents. The implications are astounding. VALSTYBĖ: Another tough question – oceans and human future. Will we have cities underwater? Will we be able to get our hands on the resources lying deep in the oceans? Or maybe asteroid mining is the future? Asteroid mining is a dream that only a few of us shared in the 1980s. Dreams of underwater cities and ocean settlement go even farther back. Both frontiers offer the potential for spectacular benefits that might enrich human society far beyond any memory of poverty, if we do it rightly. Both must overcome serious obstacles that modern technologies can’t negotiate. In accessing the vast resources from asteroids - which include almost everything we currently tear out of the Earth through mines - we must first decide to be ambitious. To become again a civilization that invests boldly in space. Sadly, that dream has been almost crushed by cynicism. Even exploration of the outer space has become an almost forgotten thing. The sea is an immense problem and opportunity, and to reach the treasures hidden in the depths of oceans we must apply plenty of science and environmental effort. The danger is that we might cause much harm, deliberately or unintentionally, seeking benefits. About 75% of the ocean floor is "desert" areas, poor in nutrients and almost barren of life. Ways may be found to "fertilize" some stretches, creating new fisheries and removing greenhouse gases from the atmosphere in an effort to stop climate change. This, however, requires formidable research so we may forecast an impact of such actions. VALSTYBĖ: With the beginning of the Space Race between the United States and the Soviet Union, many science fiction writers predicted that by the year 2000 we will have colonies on Moon, and a lot of people will be live in space stations orbiting Earth. That didn't happen. Why? When the year 2001 came around, I had to answer many questions like: "where are the moon bases we were promised?" But watch again the classic film by Arthur C. Clarke and Stanley Kubrick, 2001: A Space Odyssey. It portrayed a civilization that by the year 2001 had made greater leaps in spaceflight than we've achieved. But society had progressed much less on a human plane. It conveyed a world commanded by patronizing, smug white-male-American bosses who operated in habitual secrecy. Now, you may claim that was accurate! But put aside the reflex. Today's world - for all its flaws - is far more open and diverse. Neither the story writer nor the film director expected or imagined such changes. VALSTYBĖ: Last but not least, the most important question for us - what kind of future do you predict for small countries, such as Estonia, Latvia and Lithuania? Globalization has been a mixed blessing. Great positive benefits followed the wave of export-driven development as any nation of the world, not only successive ones, had a chance to work hard and send their children to school. This has lead to a spectacular growth of a world-majority middle class, and those educated children will demand more improvements in society, still. Globalization also carries dangers: ecological, ethical, and a risk of cultural homogenization as regional and local differences are drenched in a Standard International Culture. Corporate consolidation makes competition difficult for small countries or small businesses or individuals. Oligarchy is a mistake that plagued every society across 6000 years. But we have seen that there will be opportunities, too. Smaller nations - like individuals - must be agile. Opportunities may be sudden and short-lived, the way Finland strode across the world stage of telecommunications for a time. You must not miss them. More often, there will be opportunities for alliances our parents could never have imagined. A Lithuanian artists' collective might collaborate with a consortium of independent neural-interface designers in San Diego, plus fabrication experts in Malaysia, and create a new kind of passenger seat for Google automobiles without ever learning of the identity of the original designer… an artificial intelligence residing in one of Google's laboratories. Small countries will probably also be the drivers for innovation in governance. You will not get fresh ideas about constitutional freedom from major powers like the United States, China or Russia. Just give a glance at the tiny Iceland experimenting with governance. One always ought to search for new ways how citizens could exercise sovereignty, creative freedom, etc. Survival is possible not only owing to state-of-the-art technologies, but also to high culture that is able to reach out globally. Corporations may corroborate their predictions by collecting and analyzing Big Data, by engaging in activities ranging from social modelling to artificial intelligence, however, no matter how effective these predictions are, sooner or later, they are doomed to fail and corporations to collapse. And there is just one trait that helped corporations and human beings survive for thousands of years. That trait is resilience. It is not enough to have knowledge of the future; one must be resilient to survive. It is rather negative trends, not positive ones that are normally sought for in the future so that possible issues and risks are known well in advance. A commonplace example: George Orwell's classic novel “1984” was a "self-preventing prophecy" that stirred millions into action, working to prevent the author's vision from coming true. All human civilizations invested heavily in prediction of the future. In the past, to forecast the future, shamans read goat entrails or watched the distribution of the stars. This process has changed today, yet shamans have survived under different names, from stock market analysts to politicians and business leaders, whose job is to appraise possible scenarios of the future as accurately as possible in order to employ available opportunities and resources accordingly. Why Do the Vikings Resemble Draculas? The answer is simple – because, when trying to conquer or having conquered a certain market segment in the Baltic States, Scandinavian businessmen are concentrating with great zeal on those solutions which allow them to generate income, but ignore the systemic faults which over time affect their own business as well. Due to this reason, a certain portion of the representatives of Scandinavian business not only does not lend a helping hand in improving the system within which they are operating, but, being led by their own trifle interests, they are even impoverishing it more, and eventually the accumulating systemic problems turn back against the Scandinavian businessmen themselves. Therefore, Scandinavian concerns that publish daily newspapers, which did nothing towards a more transparent Baltic media market, are silently retreating. In their own turn, Scandinavian pension funds, which have adopted a passive standpoint in respect to the necessary systemic reforms in this field, are only concerned that in the Baltic States' pension systems, which are submerged in the swamp of negative demographic trends, there would appear some money that could be snatched up right away. However, opting out from solving systemic problems and concentrating on one's own narrow interests are not sufficient grounds for the Vikings to be dubbed Draculas, since such a short-sighted attitude is also typical of the majority of other investors. The image of Dracula is imparted upon their pension funds not so much by their efforts to extract as large a share of money as possible from the crumbling social system, but rather by what is being done with this money later on. Pension funds that reside in Scandinavian countries invest the major portion of the collected money in one way or another domestically. Meanwhile, Scandinavian funds' branches operating in the Baltic States invest in the latter considerably less, and in the Baltic stock market – practically nothing. Consequently, it is much more difficult for Estonian, Latvian and Lithuanian businessmen than for Scandinavians to attract money and to develop or acquire a business inside their countries. This moment is one of the most crucial in explaining why the Baltic States' businessmen very often regard pension funds only as instruments of generating profits for the aliens, which are enhancing the economic and investment potential not of their own country, but of those countries to which the business belongs. Not much of a more amicable attitude is emanating from the working people who, unlike in Scandinavian countries, do not see in the least way, any closer connection between the money accumulated in the funds and the economic welfare of their country and enterprises where they work. A somewhat more amicable attitude towards Scandinavian pension funds is emanating from the Baltic States' future pensioners, but they also understand that something is wrong, since in the meantime, when money keeps being transferred to pension funds, the state pension system's debts, at least in Lithuania, already reached 10.5 billion Litas in July, 2013. At the same time, it must be remembered that in Lithuania, taxes designated for retirement security, which are levied on the employee's income, are one of the highest in all of Europe, whereas the demographic-situation forecasts are one of the poorest. For this reason, our editorial desk's journalists have already tried more than once to draw the government's and market players' attention to the fact that without systemic tax reform, which would diminish the pension system's dependence on the taxation of the labour force, it will be impossible to ensure its long-term stability. In this context, it is obvious that increasing the potential of private pension funds, without attending to the reformation of the crumbling system, is at least irresponsible, if not immoral. And most importantly – extremely short-lived, since only a completely naive individual can believe in fairy-tales that as the income of the employed grows, the pension system will be enriched and will start functioning perfectly. In such a case, one should also believe that in the deteriorating demographic environment, salaries and wages will be growing very quickly, though nobody is actually going to raise them for the Baltic States' pensioners, who have one of the smallest pensions in Europe and who will still not demand for any increase! Such fairy-tales can only be taken for granted by politicians, for whom the most important thing is to refrain from making any complex decisions and who will be the first to raise those pensions as the elections approach; as well as by Scandinavian pension fund managers' representatives in the Baltic States, for whom it's indispensably necessary that assets managed by the funds would grow this year, and that shareholders will be happy and that they can receive their annual bonuses. About pension funds' activities and Poland's example, which has decided to nationalise part of the billions accumulated in private pension funds, it is elaborated further on in more detail in Monika Poškaitytė's article "Are Scandinavian Banks Sucking the Blood of the Baltic States' Pensioners?” Here we only wanted to draw Scandinavian pension fund managers' attention to how their activities contribute to the realisation of an irresponsible policy. So, when politicians are thinking of rescuing the drowning pension system with the help of the money accumulated in the pension funds during every next economic decline, that will not only be the result of political populism, but also of the irresponsible and "Dracula-like" behaviour of the pension funds themselves. Half a year after the demarche of former NSA programmer Edward Snowden, who turned into an international star, the scandal caused by the actions of the Agency for spying on the mobile phone calls of even the leaders of the US allies remains in full swing. It was discovered that the spying was authorised by a clause of the official assignments of the NSA in order to acquire "diplomatic advantage" over friendly France or Germany, or to acquire "economic advantage" over also friendly Japan and Brazil. It was revealed that the NSA spied on approximately 35 global leaders (by the way, the NSA did not even require a court sanction for that: it is only required if the object of the spying is a US national or is within the territory of the US). Public claims regarding the activities of the National Security Agency have already been made by Paris, Berlin, Rome, Mexico, Stockholm, and Madrid. It was discovered that the NSA is sucking content from fibre optic cables, breaks into laptops and listens to mobile phones all over the globe. The Agency installed aerials on the roofs of 80 US diplomatic missions. US navy vessels sailing along the shores of China are intercepting radio conversations. In the course of the Olandocard operation, the Agency's technicians connected a computer with the romantic name Honeypot to the Internet. The website was visited by 77,413 users, and in this way, over one thousand computers got infected with a spying virus. The information obtained from them can be very useful in the future, according to the NSA. In 2009, the NSA even established a unit with the task to learn about, analyse and adapt foreign programmers' practices. Former Inspector General of the NSA, Joel F. Brenner admits that the technologies applied by the NSA have surpassed political goals, while spying on the closest allies represents a poor and politically stupid practice. After the information exposing the NSA's activities was published by E. Snowden, the organisation is suffering from a "crisis of purpose and legitimacy". It also caused damage to the image of America as the bastion of democracy and a trustworthy ally. The published information caused many investigations at various levels in the USA to be carried out. During a vote in Congress, an initiative to introduce an amendment to the law prohibiting the financing of mass information collection programs was only short of 12 votes. But the NSA did not cease spying on the telephone calls of other countries' leaders until President B. Obama's Administration launched an internal inspection of its activities. Based on this information, The Wall Street Journal made a conclusion that the Head of the USA had no idea what his own spies were doing for nearly five years. It looks that for some time, everyone will be involved in passionate discussions and someone will gain political points out of this entire story. Nevertheless, when assessing the historically established intelligence practice, it is more than a picture with aggrieved goodies and rascals observing them from behind the corner cunningly (illegally). Director of US National Intelligence, James R. Clapper, Jr. on a number of occasions called the foreign countries' claims hypocritical, as they themselves are also engaged in similar spying practices. Electronic spying receives financing from the German and French governments, not to mention China or Israel. Everyone is trying to be as least vulnerable as possible, as well as curious. The USA only found itself in the centre of the dispute because the capacities of the country's special services are much more advantageous than those of other countries. European indignation is legitimate, and their coordinated efforts are needed to stop Washington from behaving in a cowboy style. But one must understand that everyone is always spying on everyone. The 21st Century is only different for the unprecedented enhancement of spying capacities by modern technologies. Therefore, it will take some time for us to learn to live in a world where unnoticed access to the private lives of other people or even heads of states is very easy. Obviously, it will be a long-term, maybe even a decade's trend. Therefore, it will not only demand for attempts to legally regulate it, but also for modes of clipping the possibilities of information accumulators. Though probably, we all realise that such regulation will not protect us against today’s technologies. Besides, in a piquant episode - the British Daily Mail of the 1st of November published a small notice about spying bugs found in St. Petersburg in Chinese kettles and irons. The information was published soon after the investigation was launched in the European Union (EU) on the suspicion of Russia hiding bugs in the presents given to the participants of the G-20 summit. Since E. Snowden was eventually provided shelter by Moscow, it is obvious who has the strongest interest in this entire story, so that the leaders of West Europe could learn new details about the activities of their "comrades" and the USA. One should not rule out the possibility that E. Snowden himself disclosed the secret data following noble intentions and without knowing that if he was in any trouble, shelter for him would be provided in Russia. But he is fighting for a world without secrets from a country which has been terrorising its neighbours with methods that have nothing to do with democracy, the free choice of citizens and human rights. Maybe this could be the reason for E.Snowden's published information to have become the cause of serious talks, but not a major crisis in the relations between the EU and US. Everyone has a perfect understanding that if an equivalent of E. Snowden emerged in the Russian special services and started disclosing their actions in respect to other countries and their leaders, the result would be no less breathtaking. The tension between the EU and US was also mitigated after it was discovered that the conversations of German Chancellor Angela Merkel were not only listened to by the US agency, but also by the special services of at least four other countries. Therefore, it is obvious that it was not nice of America to spy on its allies, but if talking about a vital problem, someone should take care of the security of Ms. Merkel's phone. One must understand that everyone is always spying on everyone. The 21st Century is only different for the unprecedented enhancement of spying capacities by modern technologies. Therefore, it will take some time for us to learn to live in a world where unnoticed access to the private lives of other people or even heads of states is very easy. It was just last year that the Norwegian company "Reitan Convenience" acquired "Lietuvos spauda" ("Lithuanian Press"). Lessons of the recession, Norwegians' determination to invest in the Baltic States and business challenges are related here by Mr. Rens Razums, General Director of "Reitan Convenience Lithuania" and Business Development Executive of "Narvesen Baltija". For both the Scandinavian and Baltic business communities, the crisis was a very good learning opportunity, though harsh and expensive. It has taken a lot of “foam” away, but those companies that are here with long term plans are staying and expanding. Certainly there are several sectors that probably will never be as vibrant as before, namely real estate with a tough market, its sluggish growth of a customer base and high development prices, or the media sector. In the media, I would guess Scandinavian companies are facing tremendous challenges and/or opportunities at home, i.e. issues with the decrease in the print media or the TV vs. Internet shift, so cutting “loose ends” is inevitable. But I am sure that other sectors like production or agriculture are becoming more interesting. And what is also important, there are more and more local players that are not just seeking money or advice, but are ready and willing to talk with Scandinavians as equal partners. I think the Baltic countries are in a very good position economically. Just think about being located in between the European powerhouse of Germany, the most prosperous part of Europe – Scandinavia on one side and fast growing economies like Poland and Russia on the other side! But there are few challenges, namely the shrinking population and the fact that our politicians do not understand the concept of competitiveness. Why are we experiencing such an exodus of population? It’s because other countries have been better at selling their image, dream or social model, and active people have chosen their offer! Many politicians still think they are sitting on “golden eggs”, although it is far from that. Every European country is competing for money, the best people and the best ideas. So what are our competitive advantages, really? I think there are few differences in business culture in the Baltic capitals. We recently discussed customer habits with a lady from Lithuania and as she said, the retail customers in Tallinn and Vilnius are more similar than in Vilnius and Marijampole, for example. And I think the same can be said about the business culture. This is because in the Baltics, I think we are very quick to adapt. Also, historically, we have lots in common with Scandinavia (small nations, German (in the background) and English–language influence, societies rather open to foreign influence, historical gender equality (compared to other parts of the world), etc. However, there are still areas I feel we are lagging behind in general – we are much less outspoken (afraid to criticize our bosses and leaders) and less sensitive to human capital. Therefore, I believe that Scandinavian investments bring a part of their own business culture here and I think we should be very happy about their vast presence in the Baltics. However, we are more passionate about what we are doing and that is a positive trend when looking to the future. The dismal days when the mafia and sheikhs were driving black Mercedes cars have ended. Now, if you want to stand out, you need an armoured "Dartz" all-terrain vehicle, so that losers could die of envy eyeing your luxury and so that enemies and deceived business partners could not hunt you down with missiles and mines. The good news is that in order to buy such a car, you don’t need to travel to the other end of the world or to look for a dictator who is selling his property for a mere trifle as the gallows approaches. It is sufficient to get to the Latvian brothers in Riga. The "Dartz" company is headquartered in the "Russo-Baltique" factory, which used to manufacture armoured vehicles for the Russian tsars in the old days and also contributed to the invention of the helicopter. As the company’s representatives say, they do not care at all about what your requirements are, since they are ready to implement all of them and surprise you. Still, no work will commence unless you open up your wallet and show them that no winds are blowing through it. How much should you have? Well, if your option is not a basic version, then there should be at least 1 million Euro in your pocket. When cooperatives were allowed to be founded in the Soviet Union in 1988, this offer was immediately snatched up by Leonard Yankelovich, thus giving birth to the "Dartz" company. According to the founder and the company’s current representative, the inspiration to create armoured cars arose after heavy vodka drinking following all the best traditions of Russian mentality. An interesting thing about this whole miraculous story is not only that Leonard himself boasts that he has never been a car mechanic of any kind (and therefore knows little about machinery), but also that he has no driver’s licence, which means that he cannot drive any of the steel horses that he creates. Each product made by "Dartz" is art, which Leonard considers to be tantamount to the famous Fabergé eggs: not everybody is so rich and not everybody can show real appreciation for a luxurious armoured car in terms of art. Besides, all cars are different. If the owners of two luxury "Bugatti Veyron" cars ever met, the differences between their cars, in most cases, would not be impressive, whereas in the case of a "Dartz", several different accessories and options exist, and much more is available for an extra amount of money. So the buyer that Leonard is aiming at is something between the rapper Lil Wayne and a Saudi Arabian prince, though both extremes are possible. Quite recently, the rapper Kanye West and his lovely wife Kim Kardashian decided to renew their car fleet. The "DARTZ Prombron Iron Diamond" car, which was assembled based upon the "Mercedes-Benz" G-Class, cost the rapper 400,000. Twice this amount was spent on the car’s extra armour and its salon interior. But because he could not manage to reach agreement with his wife on the desired colour, the rapper decided that he would buy two cars with the same set of equipment instead. After the purchase, 2.4 million was dropped into the "Dartz" bank account. Besides, a "Dartz Prombron" car can often be seen on the big screen as well. For instance, in the movie "A Good Day To Die Hard", this all-terrain vehicle was used to hunt down Bruce Willis all throughout Moscow. Whereas a bit earlier, in last year’s impressive cinema masterpiece, this gold-plated car was driven by the Wadiyan dictator and all-beloved repressor, Aladeen. If it is namely a golden "Dartz" car that you want, the price starts at 1.2 million Litas. Each "Dartz" car can be primarily chosen as a pseudo-sedan or a pseudo-platform van. As previously mentioned, the choice of optional equipment is almost unlimited; you just have to have the money. For instance, only one "Dartz" car in the entire world has a jacuzzi, whereas another one has a royal-style bed. In the meantime, other owners of these cars want as much armour as possible, so that even an indirect nuclear explosion would cause the least amount of damage as possible. Besides, all the cars are equipped by default with a black box – just like on aircraft. So, should the armour happen to be breached, the boss’s last swear-words will surely be recorded. The most expensive "Dartz" car sold with the greatest number of accessories went to China – it cost its owner 7,000,000. According to the company’s representatives, Russians always buy black cars, Arabians – white cars, whereas golden, glittering and shimmering cars are chosen by rappers. It is namely for them that special golden alloy wheels whose shape resembles AK-47 ammunition are manufactured. It is also worthwhile mentioning that this armoured all-terrain vehicle is not only one of the safest in the world, but also the fastest. The maximum speed is 180 km/h (about 110 mph) which is an excellent result for a tank weighing 4 tons. A separate topic here is the car’s protection, which exists in several options, starting with the lightest level, B2, and ending with the most complex, B7+. Moreover, the car can be equipped with cameras pointed in all directions as well as with various explosive sensors. And, if it’s very necessary, even an anti-missile defence system. Unlike those made by other manufacturers, this car is delivered already shielded and protected and, therefore, is much safer than those that, just after having been manufactured, are fitted with armour plating. Once, an armour technology was devised in the Soviet Union called "The Capsule": first, a kind of armoured capsule for the passengers is constructed, and then it is surrounded with the car’s components. The weight of a "Dartz" car manufactured with all possible protection reaches 8 tons. Even the bulletproof glass selected for the car is special – it’s the same type that’s protecting tourists from the odour of Lenin, who is lying in Red Square. Do you still doubt whether it is worth buying one? Maybe you will be encouraged by the fact that each car buyer gets a golden pistol and a small golden bottle of vodka as a present! Roubinisation of Financial Markets: What Are Financial Gurus Forecasting for the Year 2014? A major portion of the year 2013 is already in the past, so it may be asserted with confidence that it was full of surprises. Who could have ever thought that it would be this year that the United States of America would find itself only one day away from a declaration of bankruptcy, or that approximately 1 million U.S. federal workers would be compelled to take unpaid vacation for more than two weeks? Who could have ever guessed that the stocks of the developed countries would be the leading asset class this year, and that they would outperform the stocks of the developing countries by more than 20%? How many were there prognosticating that the price of gold from the beginning of the year would have been corrected by more than 20%? Of course, if we returned to the beginning of the year 2013, we would find a great number of very diverse forecasts, both pessimistic and optimistic. However, it will only be when the year finally ends that we will be able to say exactly who were right and who "missed" completely. But as most of you have probably understood from the title of this article, we are not going to talk about the past today, since it's much more sagacious to talk about the future, so further on we are going to review what is being said by the authorities of the financial world about the prospects of the world economy, stock markets, gold and currencies. Surely, at this point most of you could be confronted by an elementary question: "Why should one delve into what is being forecasted by various gurus if eventually most of such forecasts prove to be wrong?" The answer would be very simple – knowing the opinion of the majority, one may give a try at seeing what they possibly do not see. First of all, let's take a look at what is being forecasted by the International Monetary Fund (IMF) or its CEO, Christine Lagarde, for the world economy in general and for different world regions separately. The World Economic Outlook report as issued by this institution in October this year shows that the growth rate of the world's gross domestic product as forecasted by the IMF for the year 2014 will be 3.6%. This figure should exceed the growth rate forecasted for the year 2013 by approximately 0.7% or even by a quarter. The developed countries have been forecasted to enjoy an economic growth of barely 2.0% in 2014, whereof the biggest positive effect should come from the U.S. economy (+2.6%), which means that the greatest amount of the entire growth of the world economy will be carried "on the shoulders" of the economies of developing countries, which have been forecasted by the IMF to enjoy a growth of 5.1% in 2014. Hence, relying specifically on the forecasts furnished by the economists of the International Monetary Fund, a conclusion may be drawn that a positive trend is expected next year. However, there arises the question of whether the same "rosy" prospects are being discerned by the representatives of other institutions. For example, Bill Gross, Manager of the "Pimco Total Return Fund", the world's biggest bond fund, whose managed assets are currently approximately 248 billion U.S. dollars, asserts that the growth of the world economy will be weaker next year than forecasted by the majority of analysts and will barely reach 2.5%, which is almost one-third less than forecasted by the IMF. What is influencing such a considerable divergence? According to Bill Gross, since the 2009 crisis, the world has entered the so-called "New Normal" regime, i.e. where both economic growth and inflation are holding steady at very low levels, and that in the nearest future, there's nothing left apart from adapting to such an environment. So, what is the famous Nouriel Roubini saying about the world economy and the key financial markets? According to him, the world economic activity is recovering very slowly, economic growth is meagre, inflation is low and the unemployment level is high. Such a reality determines extremely low interest rates in the key economies and a variety of economic promotion programmes. However, the worst thing is that these programmes, which should help the real economy and should encourage capital investments and the creation of new jobs, are failing to perform their main function. Most of the excess liquidity goes to diverse asset classes such as real estate, stocks, high-yield bonds, etc. According to N. Roubini, price bubbles are already perceptible in the real estate markets of such countries as Switzerland, Sweden, Norway, Germany, Brazil, Singapore and China. If such a situation continues, a moment will be eventually reached when many countries and most asset classes will be overwhelmed by such bubbles, upon whose burst a sudden and deep recession awaits. What are the forecasts for global stocks? Before presenting the forecasts of several different investment gurus for stock markets in 2014, let's first remember what has occurred over the last 5 years. The current bull market commenced in March, 2009, i.e. after the biggest financial crisis in the last 70 years. During the crisis, the global stock index had lost more than 50% of its value, which means that stock prices were relatively low and that the investment sentiment and expectations of the future were rather subdued. What's most comical is that this period proved to be an especially good moment to invest! So over the last four-and-a-half years, global stocks have managed to rise in price by approximately 150%, which means that the average annual return of the period in question reached as much as 22%. What do you think, is that a lot or little? When analysing the history of the last 50 years, it can be observed that the average bull market used to last approximately five and a half years and during this period, stock prices used to rise by approximately 170% on average. Just having these facts allows one to draw a simple conclusion: considering its duration and growth, the current bull market should be approaching its end. At the present moment we should not be too surprised if, after such an impressive period, we meet an ever increasing number of optimists who, based on the past results, will not hesitate to suggest investing in stocks. However, the most interesting thing is, what are the most renowned investors saying about the future? One of the most famous U.S. stock strategists – Laszlo Birinyi, who had quite accurately foretold of the U.S. stock market's bottom in 2009 and the following recovery, is currently forecasting a further rise in the U.S. key stock index S&P 500. According to him, the U.S. stock market is presently in the fourth or last stage of the bull market, which may extend one or two years further. He also thinks that over this period, the biggest world economy's – U.S. – stock index should climb over 2,000 points (the current value being 1,762 points), and that before a decline in prices starts, the stock index may even reach 2,500 points (approximately 40% higher than at the present moment). His thoughts are basically accepted by the majority of Wall Street's strategists, who likewise assert that the U.S. key stock index S&P 500 should exceed the limit of 2,000 points sometime next year, or in the worst case, in 2015. However, the most interesting thing is that Mr. Birinyi is associating the further rise in stock prices with investors' euphoria. He deems that most investors, after the last four especially-lucrative stock market years, finally will not withstand and will decide to replace safe investments such as cash or bonds with more aggressive investments such as stocks. This psychological turning-point will be sudden and on a mass scale, and will evoke a final rally of stock prices which will inevitably evolve into a bear market. Nevertheless, notwithstanding such tremendous optimism emanating from the majority of investment gurus, single pessimists can also be found. For instance, Robert Shiller, this year's Laureate of the Noble Prize in Economics, maintains that U.S. stocks are relatively highly priced (he relies on the indications of his own CAPE index). According to him, the current pricing of U.S. stocks is at its highest since 2007, which means that, when investing in stocks for the next 5 or 10 years, one should expect poorer results than the long-term historical annual-profitability average of approximately 9%. Of course, this does not mean that U.S. stocks are going to suffer the losses that were witnessed in 2008 – 2009 for a second time, but one needs to understand that after the almost 5-year long rally of stock prices, optimists who now invest in stocks are prepared to pay practically twice as much for the same one Litas of profit. Most often, it also means that one will have to wait twice as long until the investment pays off. Before presenting the diverse forecasts of gurus for gold, I would first like to furnish a couple of very concrete facts. Over the last 10 years, the price of gold has risen by approximately 14% per annum. Considering that this result has practically surpassed all other investment instruments, it's no wonder that during the same period, there was also an increase in the interest shown in this investment instrument. Meanwhile, the second fact is that during the last 2 years, the price of gold has been constantly decreasing and since its peak, it has already lost nearly one third of its value. Most interestingly, this extremely poor result has not diminished the interest shown in the noble metal, and some are still further forecasting incredible profits for gold lovers. So, what are the gold gurus saying about the future prospects of gold? Peter Schiff is one of the most passionate gold lovers, who warned all investors in 2006 of the approaching "greatest crisis of the century", and is quite assuredly tossing around further forecasts about growth in the price of gold. He asserts that the price of gold over the course of years could exceed 2,000 U.S. dollars per troy ounce, which means that the price of gold from its current value should shoot up by nearly 50%! What's the main reason for making such a forecast? From a realistic point of view, nothing has changed – the U.S. continues to print money (like the central banks of most other countries), the amount of money within the system is growing, countries' debts continue to rise, etc. According to Mr. Schiff, we are inevitably drawing closer to the moment when countries will start going bankrupt. For instance, he forecasts that before the tenure of the current U.S. President, Barack Obama, ends in 2017, the U.S. will default on paying the interest on its debt and will be compelled to declare bankruptcy. Given such a situation, gold should become one of the main hedging instruments. Should countries go bankrupt, the price of gold could rise considerably, and only those investors who have purchased real gold will be able to retain and possibly even experience growth in their assets. Peter Schiff's forecast is accepted by another famous investment guru, Marc Faber, who has been reprimanding the U.S. central bank's managers for quite a long time and has been constantly recommending the purchase of physical gold. According to him, no single asset class is safe presently – neither bank deposits nor U.S. stocks or bonds, but if the price of gold happens to reach a price of 1,200 – 1,250 U.S. dollars per troy ounce once again, he is certainly going to buy some extra gold and recommends the same for others. What is most interesting is that two years ago, as the correction in the price of gold started, none of the above-mentioned two specialists made any comment as to the impending extremely huge losses, and since the price of the noble metal has dropped by 30%, no other choice is left apart from saying that cheaper gold is a much more attractive investment alternative while in quest of culprits. However, when it comes to gold, unlike in the analysis of stocks, there exists a different camp – i.e. the commodities [raw materials] analysts of most banks like Goldman Sachs or Deutsch Bank. Most of them, as if agreed to in advance, are forecasting lower prices for the noble metal. For instance, Jeffrey Currie, Head of Commodities Research at the U.S. investment bank Goldman Sachs, forecasts that the average price of gold should be at least 1,050 U.S. dollars per troy ounce in 2014. According to him, such weakness in the price will correlate with the fact that as the economies of the U.S. and other regions are recovering, there will be a decline in the need for promoting such economies and printing money. In turn, the threat of global crisis and high inflation will be accordingly diminished, which will lead to a greater reduction in demand for instruments used to hedge against these events – for instance, gold. In an attempt to sum up the thoughts of all the economists, investors and analysts mentioned in this article, two directions of forecasts can be distinguished: optimistic and pessimistic. The optimists assert that economic activity in 2014 should recover, which should also positively affect corporate profits and stock prices for a while. Meanwhile, the improving economic situation, especially in the United States of America, will allow the Federal Reserve Bank to start diminishing its promotion programme, which, in its own turn, should adversely affect the prices of bonds and gold. In the meantime, the pessimists’ camp asserts that the economic incentive policy implemented by the central banks of the major countries provides no real benefits for the economy and instead, just inflates the prices of financial assets. Should these bubbles burst and should a global recession start, bankruptcies of countries may ensue, in which case gold is referred to as the only source of salvation. As we can see, as many people, as many opinions. Let's not forget that forecasting the future is an especially complex and intricate task, even for those gurus who once managed to guess it earlier. So therefore, use your own head, don't take the forecasts of any guru for granted and be prepared to embrace the unexpected in 2014. None of us knows exactly what is waiting for us around the corner of "The New Year". Research conducted by "DrKW Macro Research" shows that forecasts for macroeconomic and corporate performance, bond yields and future stock prices just follow factual data, and not vice versa as imagined by many. In other words, it's not the forecasts furnished by specialists that show what's ahead in the future, instead, it's factual data that suggests how economists and analysts are going to forecast. 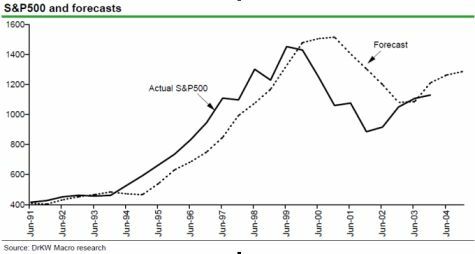 As an example, let's take the values of the U.S. stock index S&P 500 and the forecasts furnished by stock strategists for the same index. If we shifted the curve of the stock index in question a couple of months forward, then we would have two curves practically coinciding with each other. William Hunt "Bill" Gross is the manager of the world's biggest bond fund, the "Pimco Total Return Fund". The fund currently manages assets worth approximately 250 billion U.S. dollars. Over the last 14 years, the average annual return of the fund run by him was equal to 7.4%, surpassing its benchmark, i.e. the aggregate basket of U.S. bonds, by as much as 1.1%. Nouriel Roubini is an economist, lecturer and thinker. He has earned wide recognition from financial-market players after having accurately foretold the burst of the U.S. real-estate bubble in 2007 and the global recession of 2008. Roubini is most often known for his negative forecasts, and is therefore called "Dr. Doom". Notwithstanding his previous successful forecasts, during the last couple of years he also managed to err. For instance, after the global crisis had ended, he still continued for quite a long time to maintain that the recovery would only be short-lived and very meagre, but as almost 4 years have now past, he has begun to slightly change his opinion to a more optimistic one. Laszlo Birinyi is a stock analyst and investor, as well as the founder of Birinyi Associates. The firm that he founded is engaged in stock analysis and investment management. He started his career in investment in 1976. He was widely praised when he accurately foretold the U.S. stock market's bottom in 2009 and the following rise in prices. He was one of the few who asserted from the very beginning that this bull market would be strong and would surely last more than a few years. So far this guess of his has proved correct, but at this point the rest of his guesses should also be remembered. For instance, before the drop of U.S. stock prices both in 2008 and in 2000, Mr. Birinyi forecasted a rise in stock prices, but it all happened completely to the contrary – the two biggest stock-market crashes for the last 30 years soon followed. Robert Shiller is a U.S. economist, academician, author of books, and a Nobel Prize Laureate. Presently he is ranked as one of the 100 most influential economists in the world. In his book "Irrational Exuberance", published in 2000, he warned about the price bubble forming in U.S. stocks, and especially in information technologies, about the possible burst of such a price bubble and about the huge losses that may ensue. Whereas in the second edition of his book, which was published in 2005, he warned that the rising real estate prices may lead to extremely woeful consequences: the inevitable crash of real estate prices and the ensuing financial panic. Peter Schiff is an entrepreneur, investment broker, and author. He is known for his especially negative forecasts for the U.S. economy and national currency, though he speaks positively of commodities [raw materials], especially of gold, and other countries' currencies and stocks. He became famous in 2008 after having correctly foretold of the great recession and the burst of the stock and real estate price bubbles. However, notwithstanding this accurate guess, the majority of his forecasts made thereafter did not prove to be very correct. He maintained that the bouncing back of stocks that commenced in 2009 would only be short-lived, that the price of gold over the course of several years was going to reach 5,000 U.S. dollars per troy ounce and that the U.S. dollar would continue to weaken in respect to other major currencies. Marc Faber is a Swiss investor and author of the well-known monthly newsletter, "Gloom Boom & Doom Report". During his fairly long career in personal investment, he produced a great number of recommendations, but the first recommendation that made him famous was made in 1987, when he recommended that his customers sell the stock positions they possessed. For those who don't know, in October 1987, the U.S. stock indices lost approximately 20% of their value in one day. He also warned about the Japanese stock price bubble in 1990, the U.S. stock price bubble in 2000, as well as the price bubbles in stocks, real estate and commodities [raw materials] in 2008. Nevertheless, the recent years have not been very successful for him. For instance, in 2013, Mr. Faber forecasted huge losses for global stocks and a profitable year for gold, but, as we now know, the situation is completely the opposite.